Naslovnica / Zmaga: Borci za človekove pravice nerojenih otrok v ZDA bodo abortivnim podjetjem odvzeli državni denar! Zmaga: Borci za človekove pravice nerojenih otrok v ZDA bodo abortivnim podjetjem odvzeli državni denar! Abortivna industrija uspeva samo tam, kjer država jemlje ljudem denar in ga proti njihovi volji namenja za ubijanje nerojenih deklic in dečkov. V Sloveniji si že leta prizadevamo, da davkoplačevalci ne bi financirali ubijanja nerojenih otrok v slovenskih bolnicah. WASHINGTON, D.C., January 19, 2018 (LifeSiteNews) – Undercover videos shared on major social media sites about the abortion industry’s dirty secret of illegally selling aborted baby body parts for profit are responsible for the current momentum to defund Planned Parenthood, Center for Medical Progress founder David Daleiden said at the Pro-LifeCon Digital Action Summit this morning. Daleiden said that the undercover videos produced as part of the abortion giant sting have been collectively viewed more than 14 million times on YouTube and other platforms. "They have brought Planned Parenthood to the brink of being one vote away from being defunded by Congress," Daleiden said. The pro-life cause is winning, he said, but the abortion giant is battening down the hatches and doing everything it can to make sure the remaining videos are not released. Daleiden made the comment at Family Research Council’s (FRC) 13th annual Pro-LifeCon Digital Action Summit Friday morning in Washington D.C., prior to the 45th annual March for Life. “We have to keep getting the information out there,” Daleiden stated. During the conference, activists, policy experts and legislators discussed the most successful online strategies of the past year at the event and also anticipated possible opportunities going forward. Rep. Marsha Blackburn (R-Tenn.) updated specifics of the result of the House Select Panel on Infant Lives, including 15 criminal referrals in 11 states and four referrals to the Department of Justice. Blackburn said the DOJ is taking up all four referrals and the FBI is taking up the entire body of work. Blackburn remarked that this has been able to happen because of the work of pro-lifers getting word out on the abortion industry’s baby body part scandal, done largely via social media. “Because you are so diligent, it does yield fruit,” Blackburn said. The Radiance Foundation’s Ryan Bomberger told the summit that Planned Parenthood is fighting even harder on every level to quell the truth, said Bomberger, because of the threat it faces with having so much if its operation exposed via undercover journalism and social media in recent years. Bomberger touched on the importance of using digital activism, because of the silence and complicity of the mainstream media with big abortion. “We don’t have the luxury of being silent,” he told the summit. A young pro-life woman who ran across the country to raise awareness for the pro-life cause spoke to the FRC Pro-LifeCon Digital Action Summit about her ministry Project If Life, saying that social media was instrumental in making it happen. Anna Hoduski shared a difficult experience she had in the desert of California during her cross-country run. Cactus was cutting her legs and tripped her, causing her to fall into a ditch. Hoduski shared how she’d come to realize at one point that God called her to do this. “The whole reason is because life matters,” she said, encouraging the digital pro-life activists listening to trust God in taking on pro-life work. Hoduski told the those present and tuned in online for the summit to have hope, even when people say “no” to your pro-life message, and in times where there’s just a few there to receive it. God has people in place to help you in your journey, Hoduski said, and even when there may be only one or two people in front of you – that was who was supposed to hear the message in that moment. Don’t get discouraged in your deserts, Hoduski told the audience, get involved where you are. Social media is powerful, she explained, in that a beautiful photo or a simple quote can make a difference. A social media panel convened at the summit with Brynne Krispin, FRC’s Social Media Manager, Lyndsey Fifield, Social Media Manager for The Heritage Foundation, and Andrew Moore, Digital and Creative Director for Susan B Anthony List (SBA). Among the panel takeaways was the fact social media is an important tool for conservatives to communicate because of mainstream media bias. Also, conservatives and pro-lifers can work together when there is content suppression to gather evidence to present to Twitter, and also get it to the media - in particular by taking screenshots when it occurs. An organic tweet on the topic of content suppression can be more effective than an actual Twitter ad as well. Information shared on social media doesn’t need to be combative, it was said during the panel discussion, rather, simply sharing new research, for example, ultrasound images of unborn children can be very effective. Interspersing humor is good too, instead of always being serious or overly political. Students for Life of America (SFLA) Spokesperson Missy Stone spoke after the panel about SFLA’s social media approach, which she said is crucial, since this is where young people are immersed. The group works across all platforms to meet young people where they are, its campaigns speaks their language, and informs them about what’s going on in the movement and how to get involved. 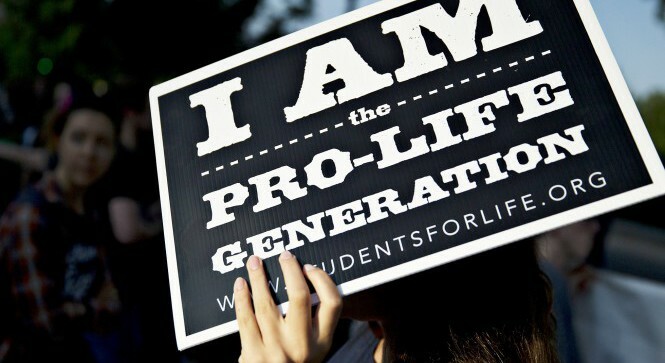 Stone shared an SFLA’s daily Pro-Life Generation videos, explaining that they are purposefully produced to be short, informative and relatable. Montana Republican Senator Steve Daines challenged the summit’s participants to support the hash tag #20weeks, to illustrate the essence of the Pain-Capable Unborn Child Protection Act. Daines said a simple Google search for 20 weeks - no mention of abortion - yields images that effectively communicate the message of fetal development at that stage or pregnancy. David Scotton, producer and the subject for the upcoming film I Lived on Parker Avenue, introduced the movie’s concept, based upon his adoption story. The movie chronicles his story after he was slated for abortion, but saved after his mother encountered sidewalk advocates. Scotton explained that his strategy was for the film to be released online, versus conventional streaming outlets, because it was the best way to reach those who need to be reached. He asked summit participants to share the film’s trailer, and to also share the movie online when it’s released March 8. Live Action President Lila Rose spoke of the importance of telling pro-life stories of both mother and child through digital media, and packaging those stories in such a way that people will receive the message. Live Action’s videos have received some 86-plus million views on social media, she said, also mentioning the group’s ads having been suppressed by Twitter. Rose said that it’s been shown that graphic abortion images are too much for people not ready for processing them, so the group has produced video that demonstrates abortion procedures via animation, and found them to be very effective. This was demonstrated by a before and after video of people watching Live Action’s animated abortion footage. Rose said it was also important to highlight through digital activism the good things happening legislatively and individually in the pro-life movement. The movement needs to awaken people’s pro-life hearts, she said. Rose was presented with FRC’s Digital Pro-Life Pioneer Award at the close of the summit.